Tenley Carroll Seli - Attorney | Lynch Seli, P.C. Tenley graduated from Providence College in 1991 where she received her undergraduate degree in humanities with a minor in political science. She received her law degree from the University of Richmond School of Law in 1995 where she was President of the Women Law Students Association and treasurer of the Student Chapter of the American Bar Association. She started her own practice following law school focusing on litigation and general civil work. 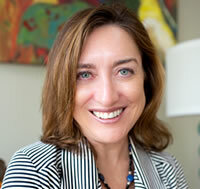 Tenley went on to practice in a boutique law firm specializing in workers’ compensation and followed that with founding a new firm with a partner where she again focused on workers’ compensation defense before the Virginia Workers’ Compensation Commission as well as appellate work before the Court of Appeals of Virginia. Tenley is a member of the Virginia State Bar, Virginia Association of Defense Attorneys, American Bar Association, and a member of the Virginia Workers’ Compensation American Inn of Court. Tenley is a member of the Virginia State Bar, Virginia Association of Defense Attorneys, American Bar Association, and a member of the Virginia Workers’ Compensation American Inn of Court.